The rumors on the internet today would suggest that Amazon will launch the Kindle eBook reader in the UK next week and certainly in time for Christmas. This is worth keeping an eye on if you have a keen reader or gadget collector in your family as this could make a great Christmas present for them. In the US the device sold out as soon as it was launched and although Amazon don’t publish sales figures it is believed to have been very popular. In the week of the new Dan Brown title being published in the US, it was widely reported that the eBook version on the Kindle outsold the paper version on Amazon.com. The Kindle is a great device and has had many excellent reviews but you may want to wait a little longer. If you are only likely to buy one device in the next 12 to 18 months you might want to wait and see what the Apple iPad or iTablet looks like when it is launched early in 2010. The rumors are that the iPad is likely to be a wafer thin multi-touch screen device based on the Mac OS X Snow Leopard Operating System but with the ability to run iPhone applications as well as standard Mac applications. I mention this because if even half the rumors about the Apple device are right and they sell it for a sensible price it will be a really useful portal computer, eBook reader, netbook replacement all rolled into one. On the other hand if you know someone who just has to have the latest gadget or someone who has expressed an interest in the eBook readers already available in the UK, this will be the ideal gift for them this Christmas. I’m really not sure now how I found this, but a few days ago I was exploring the free applications in the Apple App Store and came across an eBook of Charles Dickens, A Christmas Carol. I hadn’t tried reading a book on my iPod before and I like to read A Christmas Carol to help get me thinking about Christmas. I downloaded the free eBook from the App Store in a few seconds and was really pleased with what I found. The eBook lets you set the font size and background colour, which is great at the end of the day when your eyes are tired. This application can also scroll the text automatically like an autocue, with the speed varying depending on the angle you hold the iPod (or iPhone). Having this as an eBook means that I can read it anytime and anywhere when I get a few minutes. The other nice thing about reading on one of the Apple devices is that you can easily cross reference what you are reading with other reference works. For example in the first chapter Dickens refers to Saint Dunstan. I wanted to read the background to this reference and was able to quickly switch over to the Safari web browser and read all about Saint Dunstan on Wikipedia. So my tip for today, if you own an iPod Touch or an iPhone, why not download this free application and read this classic. It will help get you in the mood for Christmas and focus on the less commercial aspects of the season. Today we reach the milestone of 3 months until Christmas Day. The lead-up to the Christmas is critical to the success of most shops, with about 30% of their annual turnover typically being achieved during the Christmas and New Year season. Although many of us think that Christmas starts far too early these days, this milestone will see retailers stepping up their preparations for Christmas to another level. For example next week will see the publication of many of the books which are aimed at the Christmas shopper. There’s little surprise that the book widely expected to be the best seller this Christmas is Jamie’s America which was released to tie in with the transmission Jamie Olivers highly successful Channel 4 series of the same name. 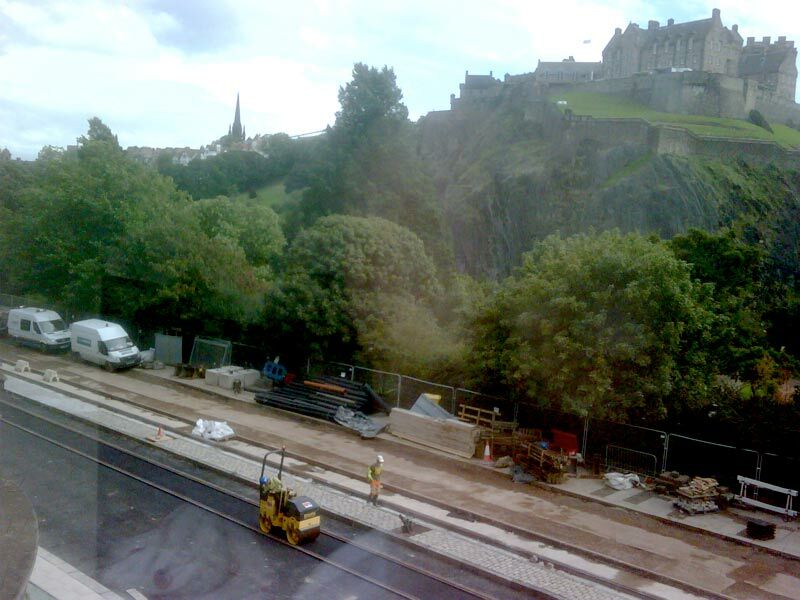 In Edinburgh Princes Street has been seriously disrupted all summer as the road is closed to all traffic, including buses and taxis while a new tram line is being built. It was reported today that retailers on Princes Street have persuaded the city council to reopen the road to buses on November 28th in time for the Christmas and New Year shopping season. I took this picture of Princes Street with Edinburgh Castle in the background a couple of weeks ago from the top floor of Waterstones bookstore. Hopefully the works will be completed on time and the road will be open to buses again on November 28th as planned. Just in time for Christmas and a few days before the rumored launch of a new range of Mac hardware, Apple will tomorrow (Saturday Sept 26th 2009) open their 270th retail store in Norwich (Norfolk England), which will be followed a few hours later by them opening their 271st in California in the USA. Meanwhile Retail Week reported today that they had commisioned ICM to poll shoppers about their purchasing intentions this Christmas. They claim that a third of the people polled plan to spend less this Christmas than they did last year and last Christmas was the worst on record for the retail sector. But this is going to be an unusual Christmas. The threat of postal strikes here in the UK and the constant media reports of delayed post is beginning to shake peoples confidence in the ability of mail order and internet retails to deliver the goods. If the threat of a postal strike doesn’t get sorted out soon this could be the first year that actually see’s spending online decline in favor of the high street. So here we are, three months before Christmas and it’s really interesting to see how things are warming up. Today (9/9/2009) Steve Jobs of Apple announced their Christmas line up of iPod models following on from the launch of the iPhone 3GS a few months ago. The new range sees the entry price of the iPod Touch dropping to just £149. This seems like great value for a device which is a pocket computer, allowing you to check your e-mail, surf the web over wi-fi and run other applications, it also a good iPod and a great portal games machine. The new iPod Nano now starts at £115 and includes a video camera, FM radio and a Pedometer so you can track how far you walk each day. The new iPod shuffles now start at just £45 and come in a range of new colours, functionally the main change is the addition of the new Voice Over feature which announces the name of the track you are about to listen to. With the new range and new pricing one of the new iPods would make a great Christmas present for someone who is still using one of the older first or second generation iPods and who doesn’t want to take on the ongoing cost of running an iPhone.